We’re Going on a Bear Hunt is a children’s picture book, written by Michael Rosen, illustrated by Helen Oxenbury, and published by Walker Books, 1993. Go on a bear hunt and do the actions with this award-winning picture book classic. 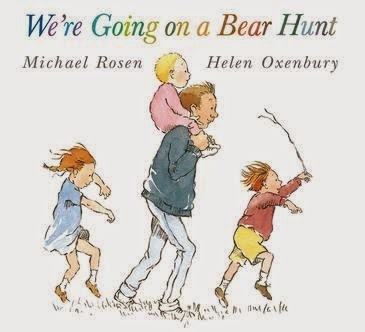 Long before Rosen wrote this book, kids in schools were chanting and echoing “Let’s Go on a Bear Hunt”. Rosen has given it a new slant, adding some characters who think they’re brave, lots of lovely sound words, tension and a great rhythm. Oxenbury has given real variety to the illustrations, with some in sketchy black and white and others in mellow colour. The format of the illustrations changes on the family’s run from the bear - instead of full page spreads, we get multiple long panels helping us read really fast! Do watch the video below to see Michael Rosen himself performing the book on YouTube. See Helen and Michael discuss the book and its creation. Thanks very much for the link, Lauren - the activity looks really useful. Love Michael Rosen's rendition. I love that it is a book that encourages so much movement and fun and games as well as memory. Yes, Lesley, exactly! The teacher in me loves the memory aspect, but my inner child, and all the kids I know, just love the possibilities for FUN! I sang this song in Boy Scouts when I was a kid, but instead it was called "Going on a Lion Hunt"
That's the same idea I think, Chase. I knew it as Going on a Lion Hunt too, but we chanted it, not sang it. Kids loved it then, and do now!